In my 18 years of practicing optometry, I’ve heard all of these comments or something similar, and everytime I want to proclaim an important message: Protecting your vision requires maintaining good eye health. And better eye health requires annual eye exams. Did you know, according to a recent survey conducted by VSP Vision Care and YouGov, eight-in-ten people rate vision as the most important sense and nearly everyone agrees that having healthy eyes is important, but only half of people actually get annual eye exams?! Although alarming, I’m not surprised as most people are unaware an annual eye exam can check for more than just clear vision and the need for glasses or contacts. I’ve noticed that in my practice most people don’t associate their eyes with the rest of their body and overall health. Virtually no one knows that signs of serious diseases and conditions like high blood pressure, high cholesterol, thyroid diseases, and certain types of cancers can be detected through an eye exam. In fact, the eyes and overall health are all connected. And eye doctors are frequently the first to detect signs of abnormal health conditions. During an eye exam, eye doctors have an unobstructed view of blood vessels and the optic nerve which is an extension of the brain. In addition to the serious diseases noted above, we are also routinely checking for dry eyes, digital eye strain, cataracts, diabetic retinopathy, glaucoma, macular degeneration, and so much more. Regardless of age or physical health, eye exams can identify early signs of eye conditions before they impair your vision or cause permanent vision loss. Typically, after I share the importance of an annual eye exam, most patients I talk to agree that it is a necessary part of their overall health plan. If your vision is important to you and you want to protect it, schedule an eye exam with your local eye doctor and have your eyes examined. And don’t forget, kids need regular eye exams too! A majority of learning is visual and screenings performed at school or at the pediatrician’s office are not meant to be comprehensive. This is a guest blog post by Dr. Mei Fleming, the founder and practicing optometrist at Luminance Vision Optometry in Lafayette, CA. She is also the creator and author of Eye Like Fashion. 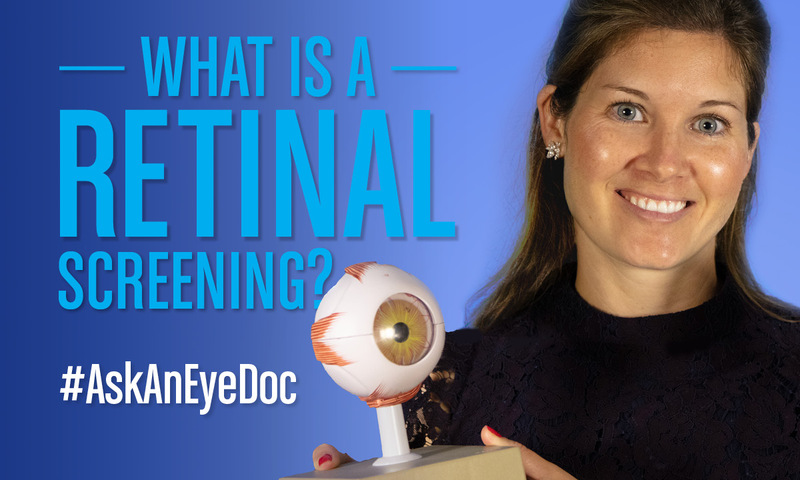 What Are the Benefits of a Retinal Screening? Getting an annual eye exam is about more than checking your vision. An eye doctor will examine everything from visual acuity to the pressure of your eyes to signs of any infections or diseases. They are looking at the overall health of your eyes. That’s why it’s so important they look at not just what’s in front of your eyes, but also what’s behind them. That’s where a retinal screening comes in. “[It] allows the doctor to have a wider view of the inside of your eyes without having to dilate your pupils,” explained Dr. Meghan Riegel. Dr. Riegel shared that retinal screenings use high-resolution imaging systems to take pictures of the inside of your eye. In addition to helping detect diseases early, these images provide a permanent and historical record of changes in your eye. Images can be compared side-by-side, year after year, to discover even subtle changes and help monitor your health. “The screening helps me see inside of your eyes and its more convenient for you. It’s a win-win!” said Dr. Riegel. Retinal screenings do not replace regular eye exams, and in some cases, dilation may still be necessary. Talk to your VSP network eye doctor to see if retinal screenings are right for you. Is It Time to Change Your Contact Lens Case?